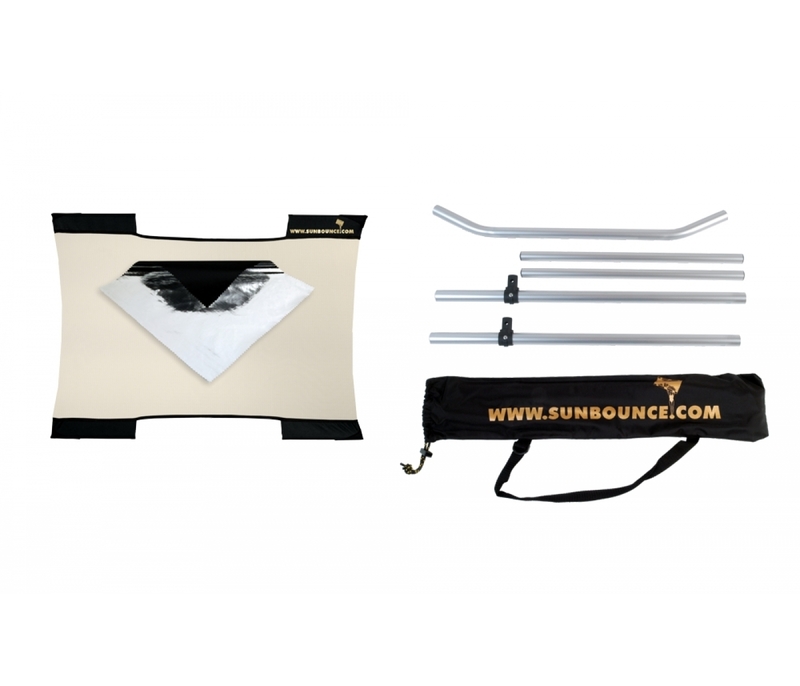 The ultra mobile SUNBOUNCE-CLASSIC 3-D, SUN-BOUNCER with aspect ratio of 4:3. 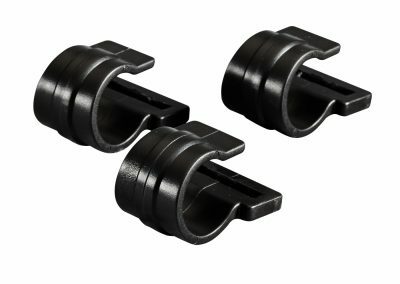 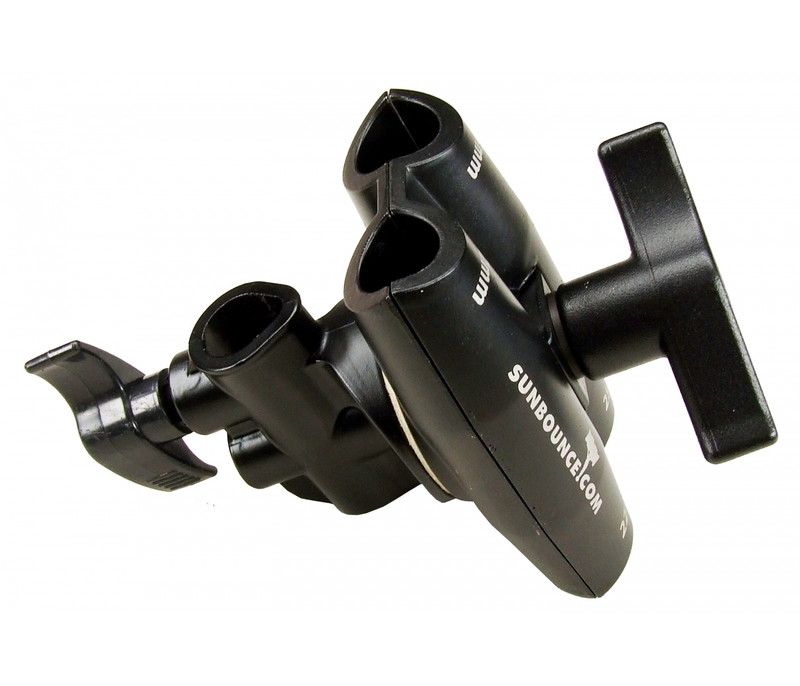 Strong three-dimensional frame construction with handling grips. 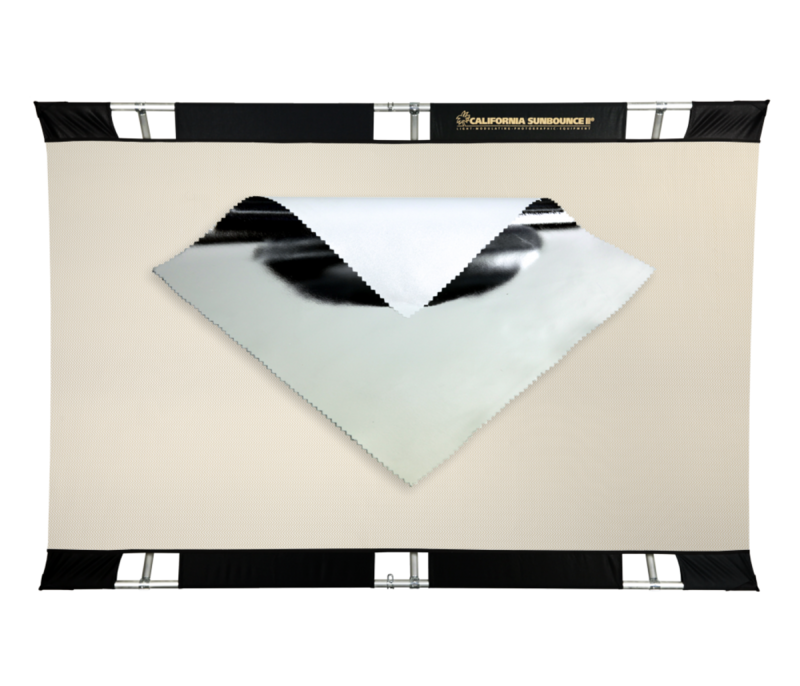 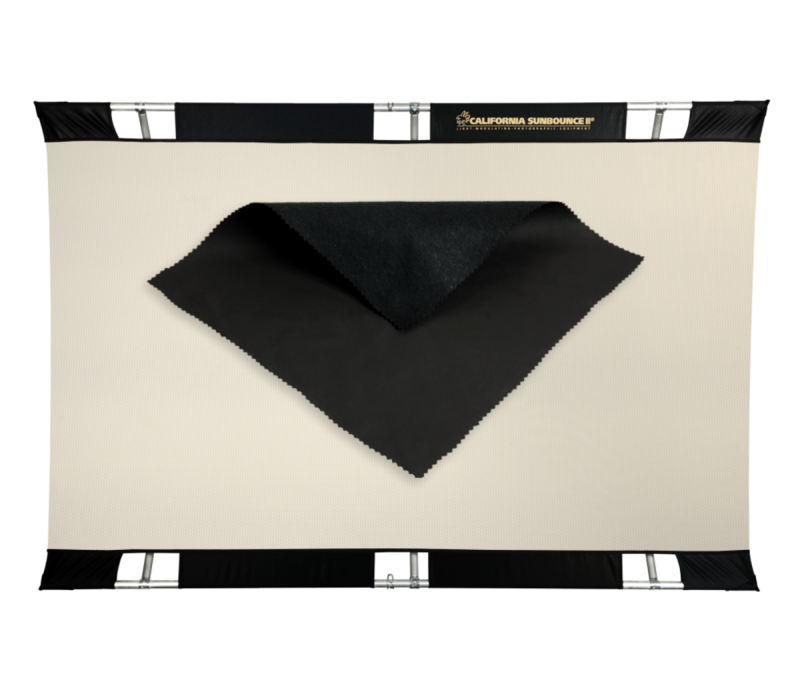 SUNBOUNCE MINI Photography Reflector is like a medium softbox in size, 3-foot by 4-foot. 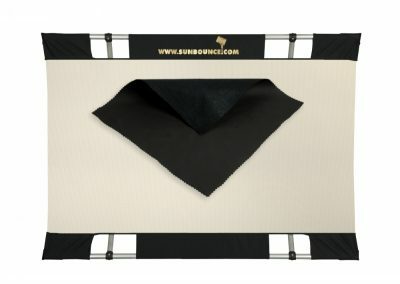 A must have for any photographer. 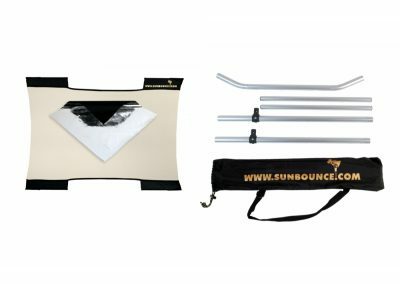 The ultra mobile SUNBOUNCE-CLASSIC 3-D, SUNBOUNCE all have an aspect ratio of 4:3 and are composed of a three-dimensional frame construction with strong hold and hand grips—ultimate and unique construction when it comes to photography reflector, light enhancing tools. 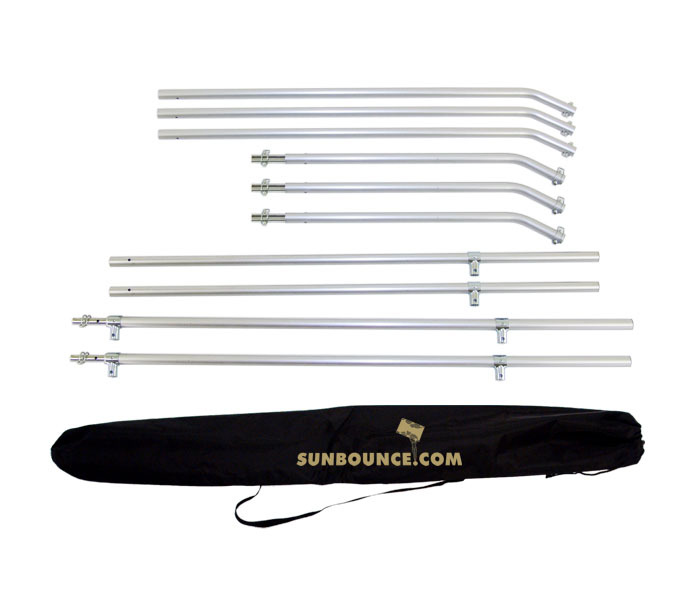 that range in sizes from 180 x 245cm (6’ x 8’) to (2′ x 3′ – 8’0″ x 5’11”). This material does not change the color temperature but transmits the incoming light in a neutral manner. 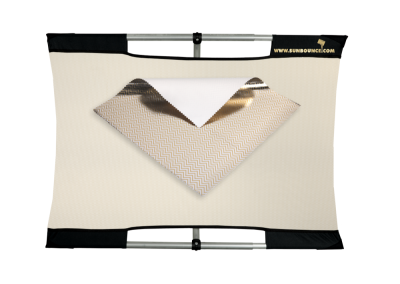 Hard light remains hard, soft light remains soft. 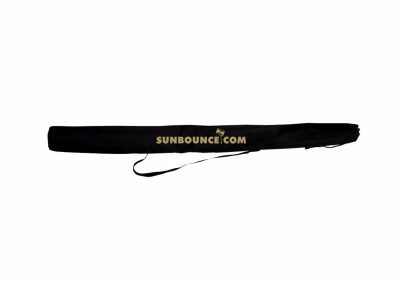 Good light scoop. 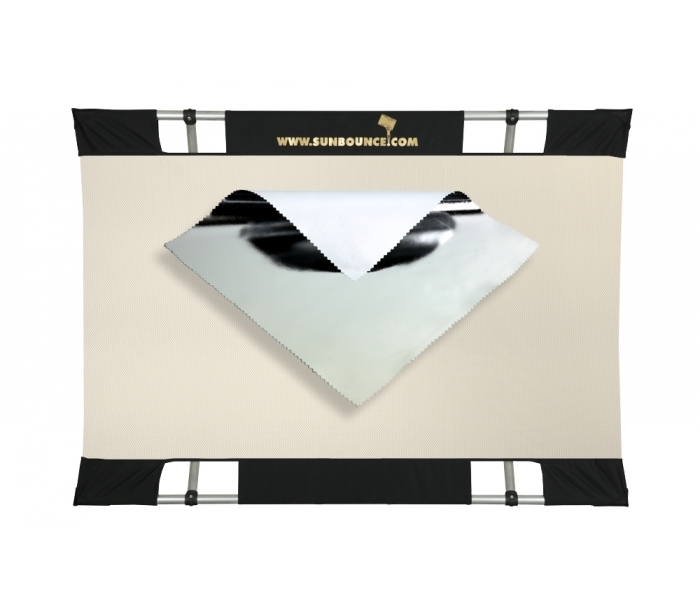 Color: Silver. The back is White Neutral. 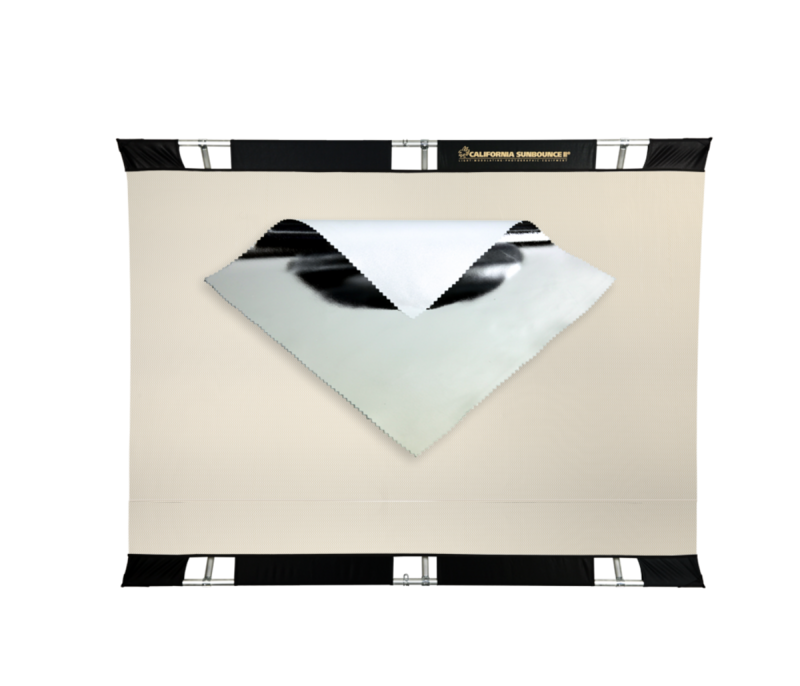 Screen details here. 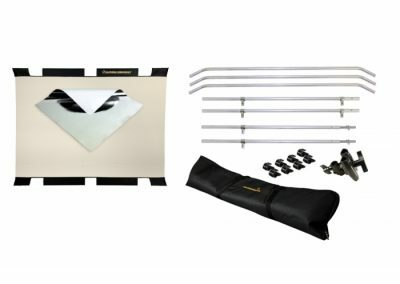 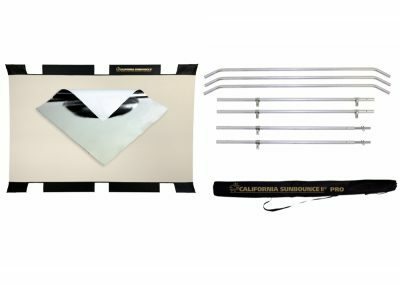 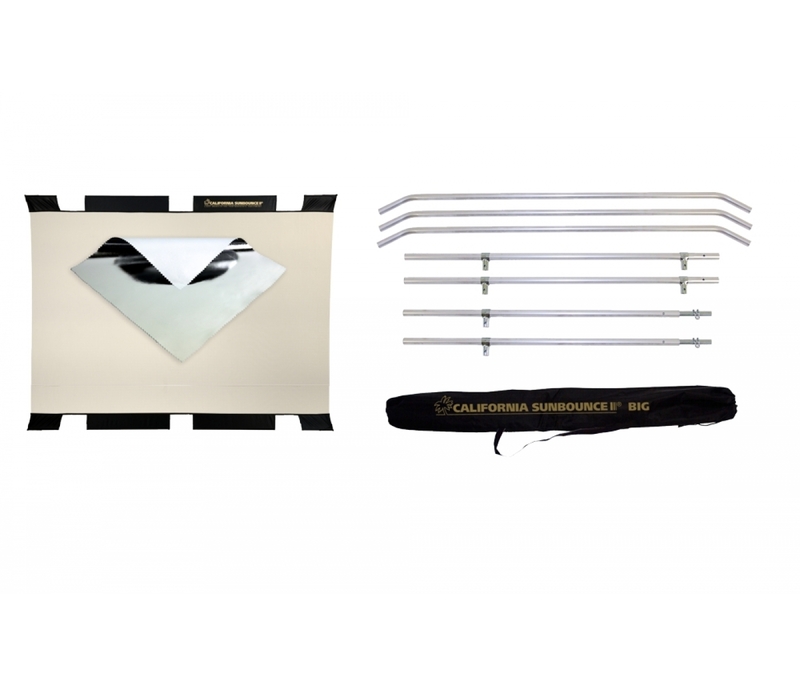 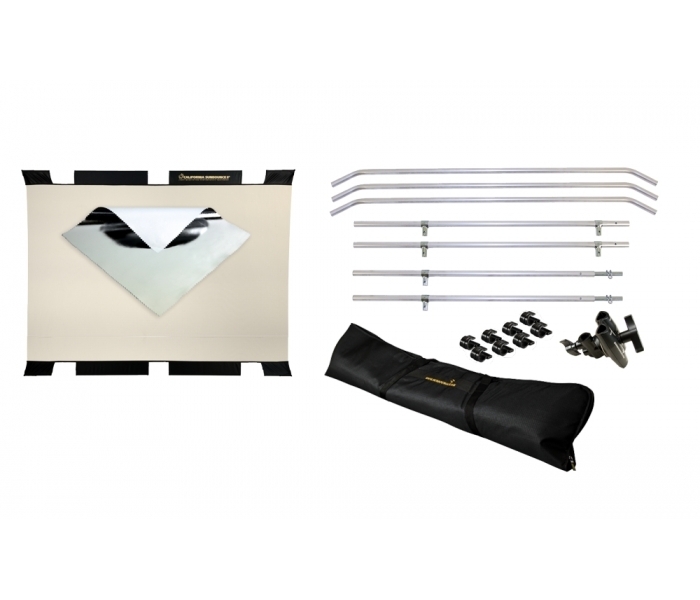 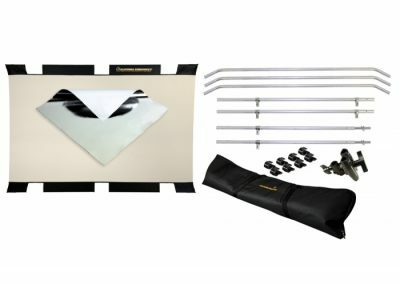 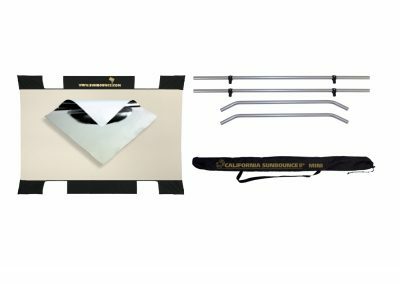 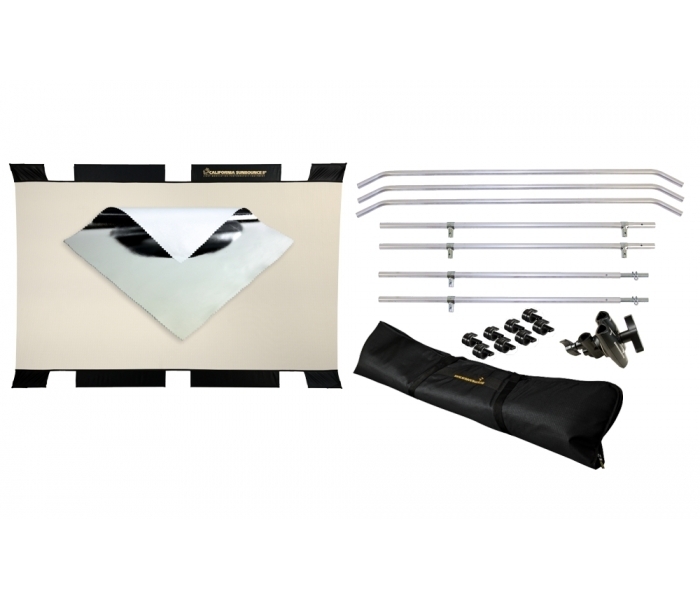 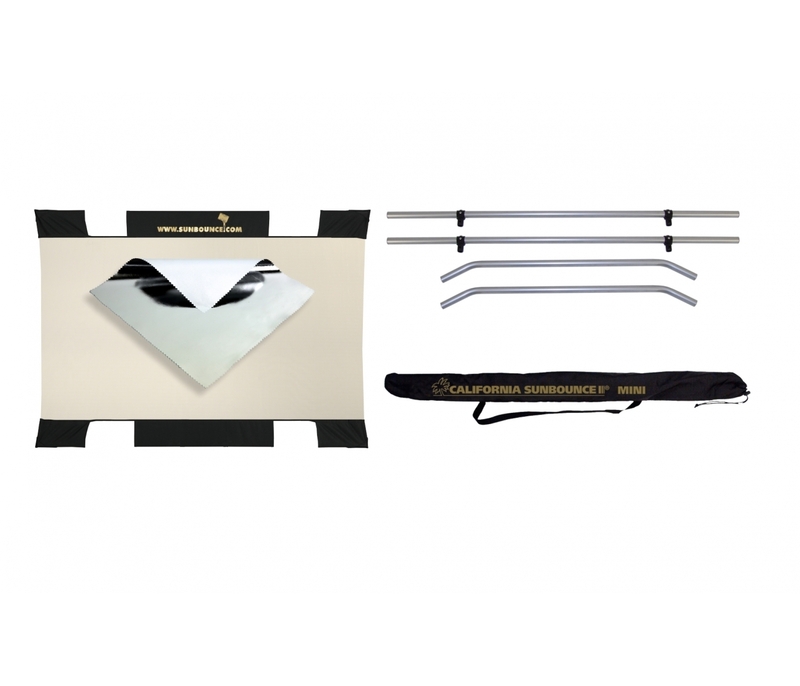 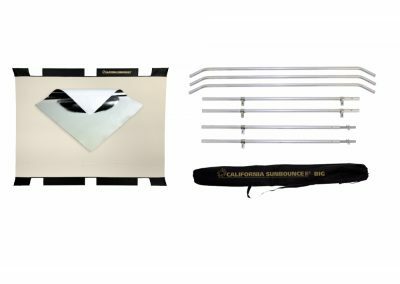 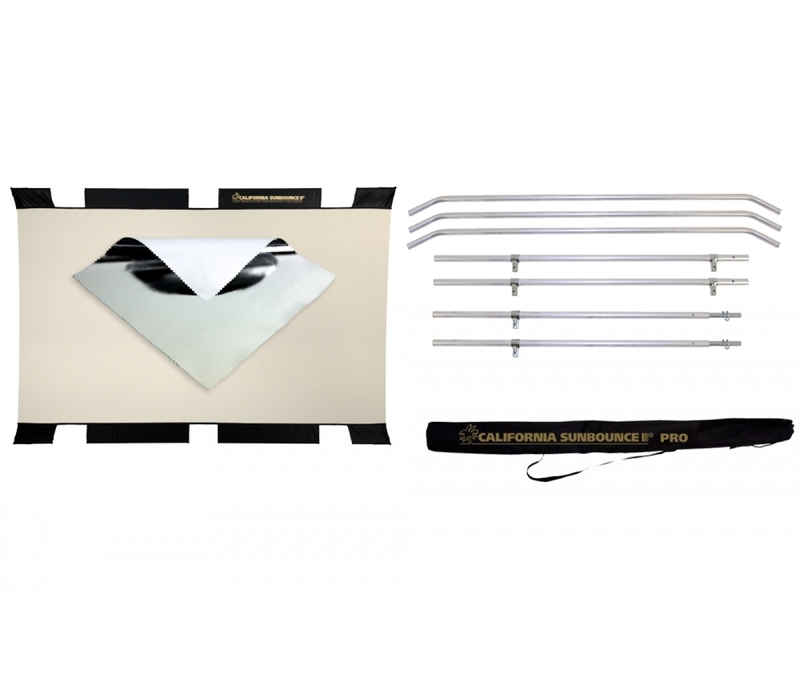 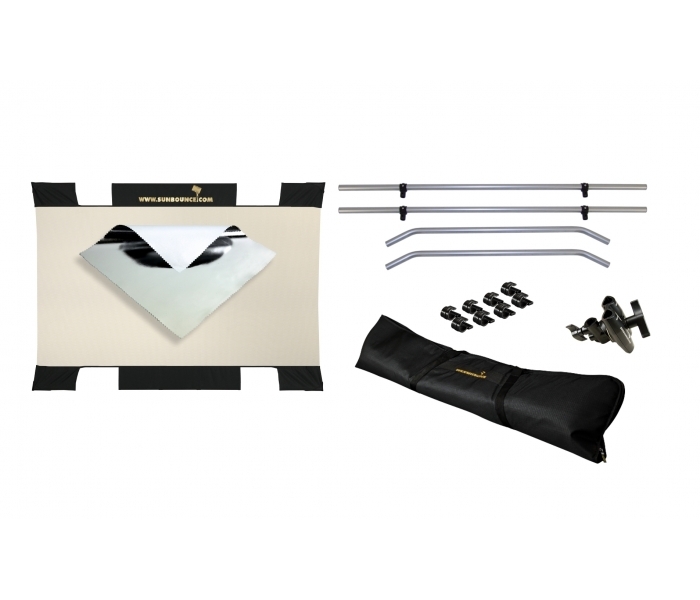 California Sunbounce photography reflector light enhancing kits come with one screen from three of the many available screens listed below. 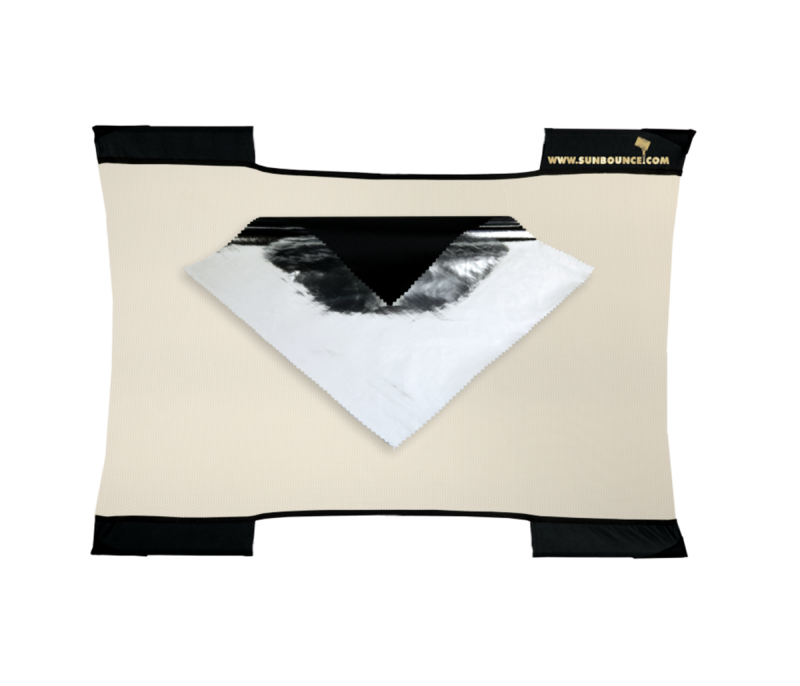 Gently warm, creates a healthy skin complexion even if cloud cover is thick. 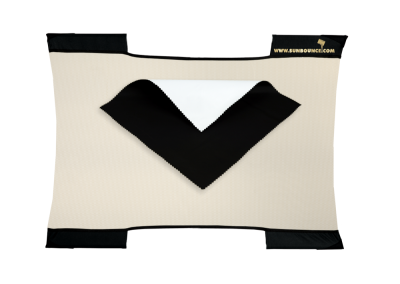 Zebra is the workhorse for more than 50% of all applications in sunny and shady conditions. Color: Mix of Gold and Silver. The back is White Neutral. Screen details here. 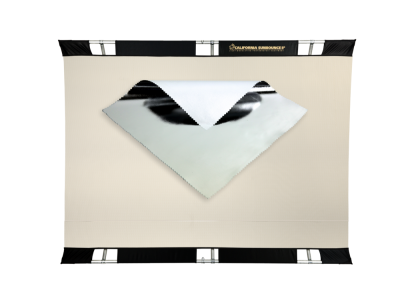 The negative reflector absorbs the light like thick, black velvet. 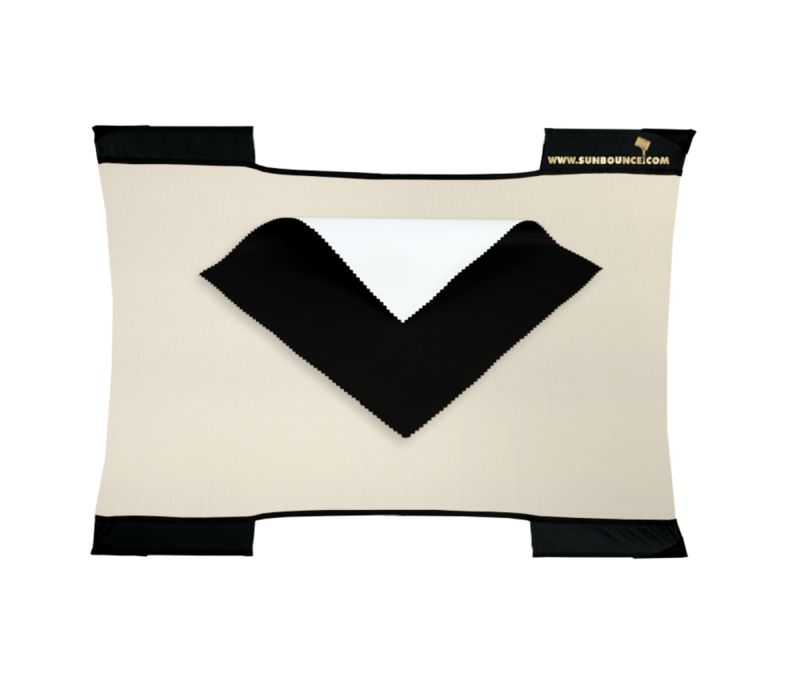 But it is much lighter than velvet and elastic. 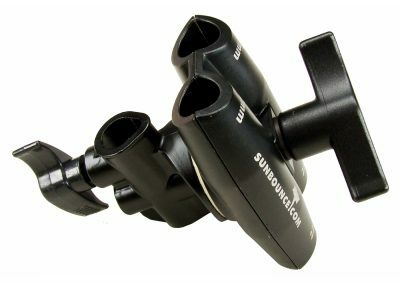 Good for light reduction. 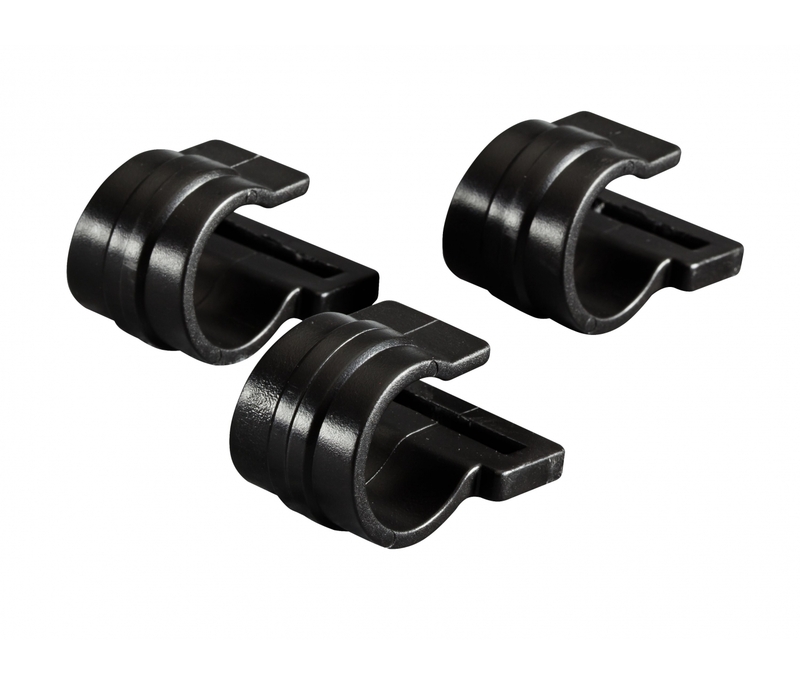 Color: Black deep matte and strongly light absorbing. 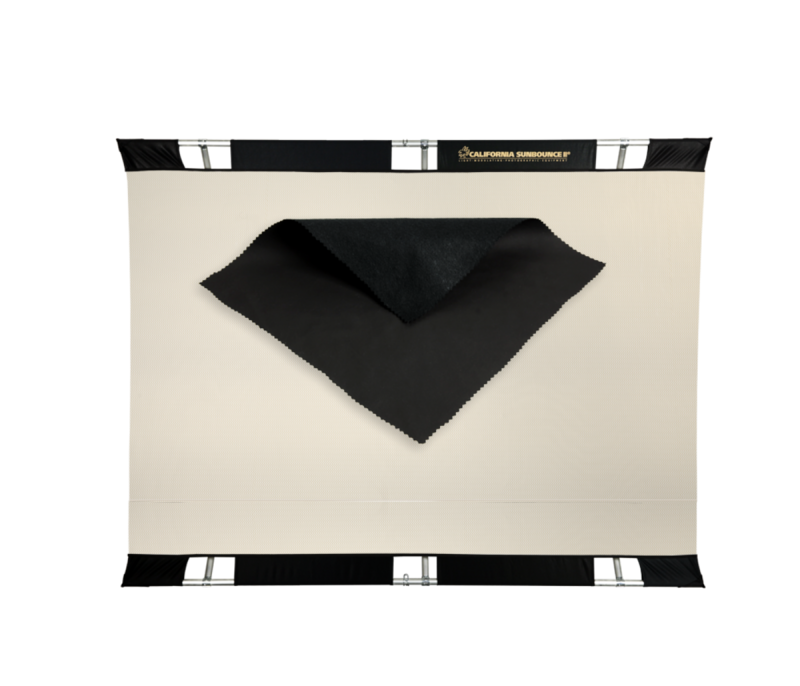 The back is Black Matte. Screen details here. 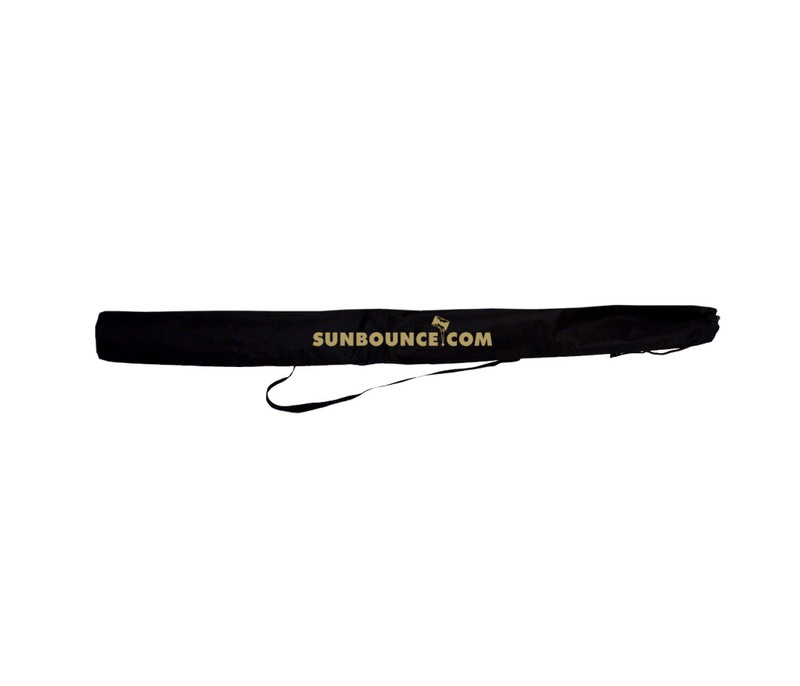 Gently warm, creates a healthy skin complexion even if cloud cover is thick. 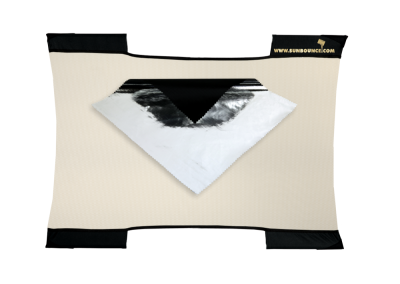 Zebra is the workhorse for more than 50% of all applications in sunny and shady conditions. 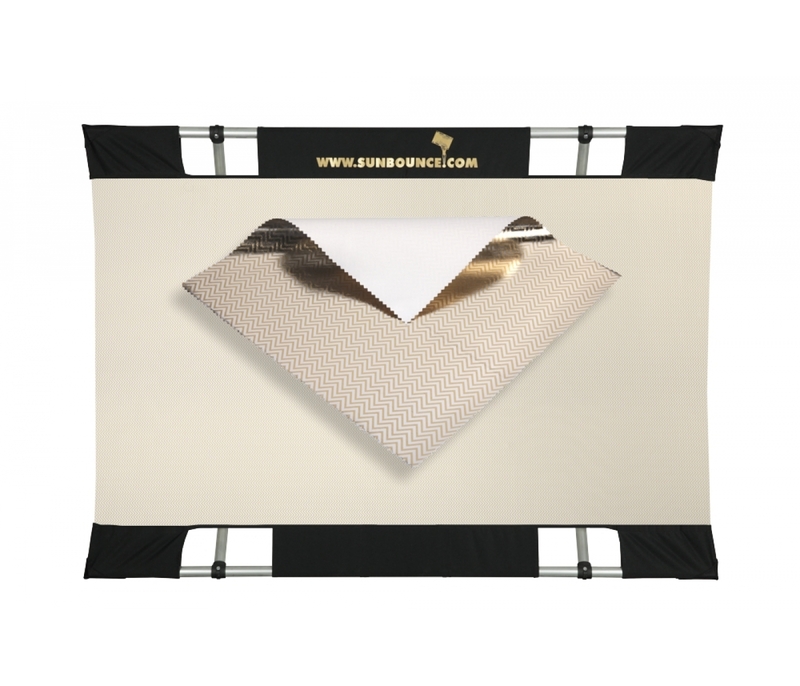 Screen details here. Color: Mix of Gold and Silver. The back is White Neutral. 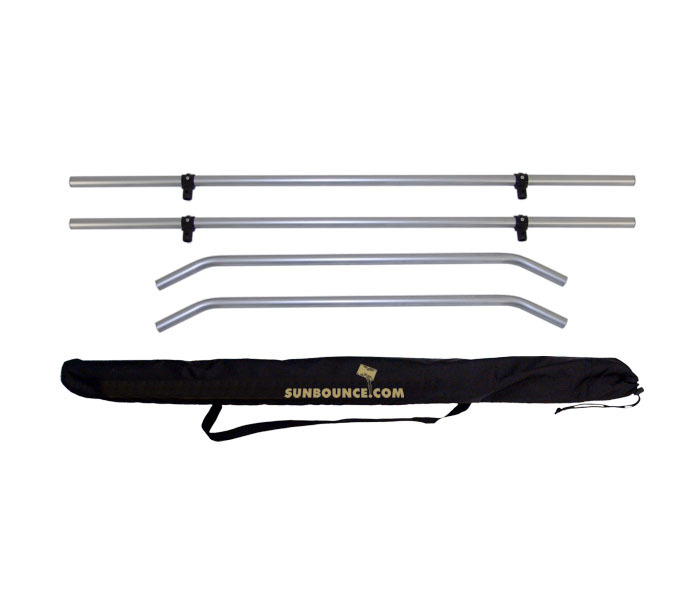 The SUNBOUNCE frames are three-dimensional, completely collapsible frame. 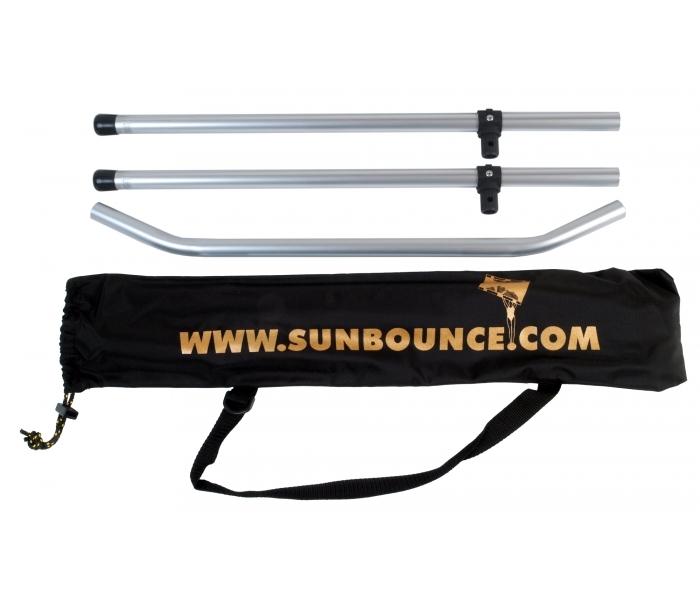 It is super light and extremely stable. 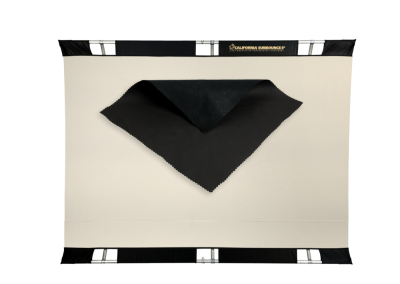 The modular system allows you to combine every frame with the appropriate screen, making it a reflector, diffuser, or light blocker (shade). 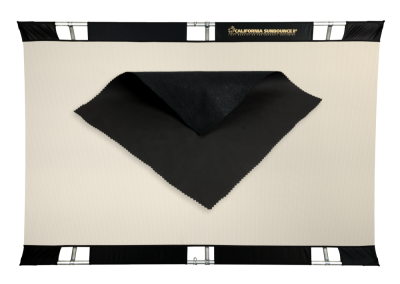 These special frames, made by hand from anodized aluminum, can be collapsed in seconds to fit into an approx. 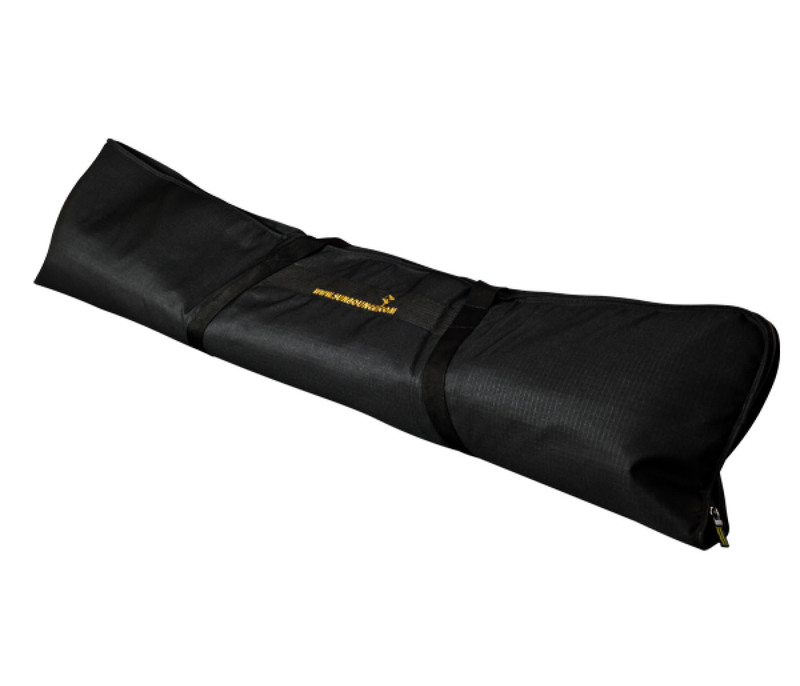 6 to 8cm (2.3 to 3.1in) diameter bag. 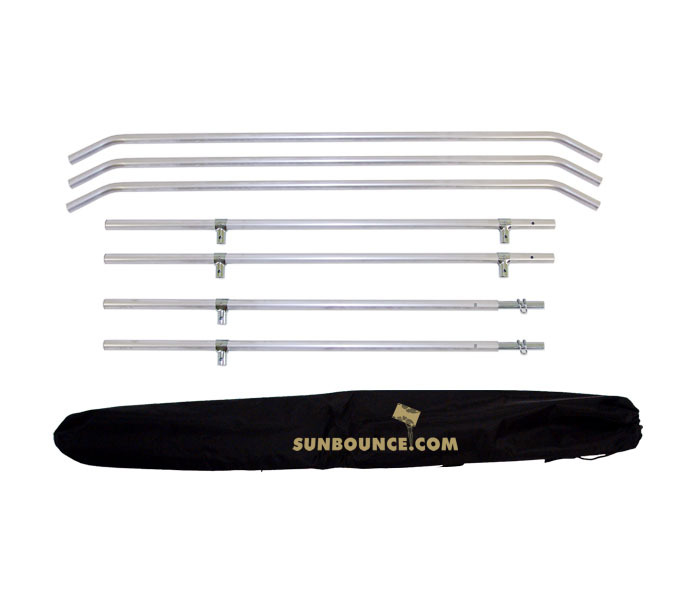 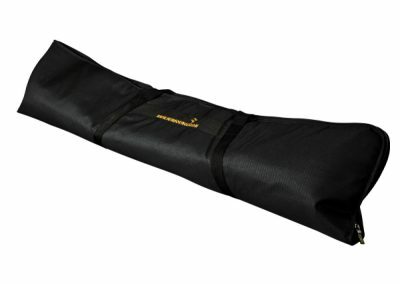 All SUNBOUNCE items have a maximum length of 135cm (53in). 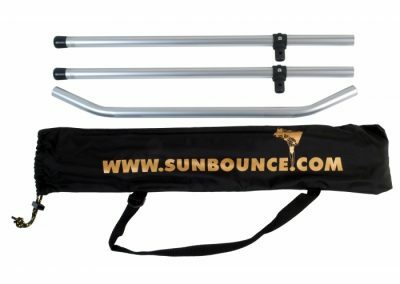 Thanks to the crossbar and clamp integrated into the frame, it can be held in many different ways – comfortably by hand or by attaching it to a stand. 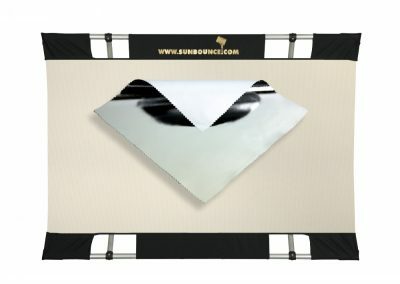 SUNBOUNCE reflectors are made in Germany with proven engineering including hand-sown fabric screens. 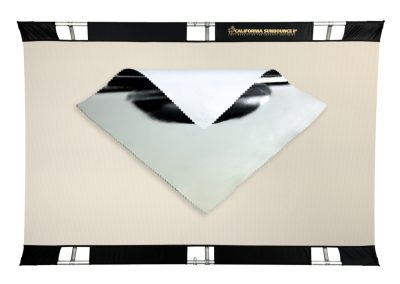 The manufacturing process includes total quality management. 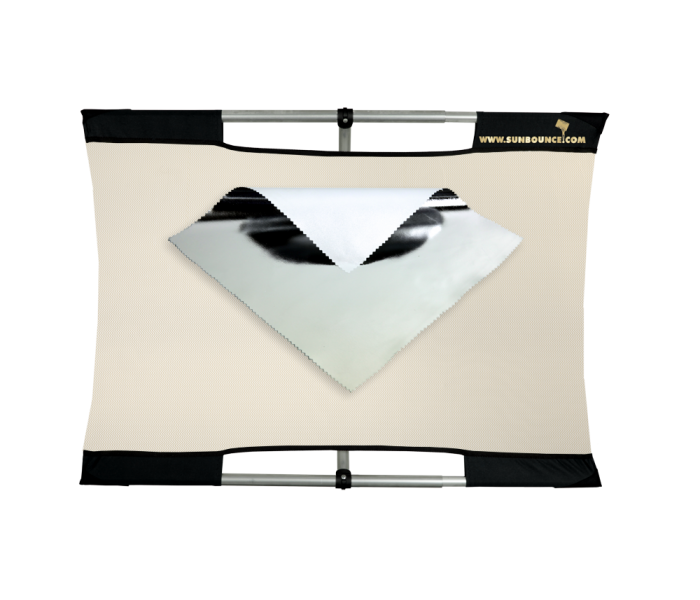 Their most popular photography and video reflectors include the MICRO-MINI, MINI and the PRO versions. Fabrics come in many types, including “3-D fabrics,” but the core fabrics include white, black, silver, gold, plus the most popular, the ZEBRA, a mixed pattern of GOLD and SILVER fabric. 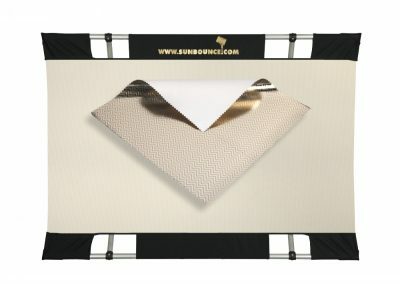 All SUNBOUNCE screen and types here. 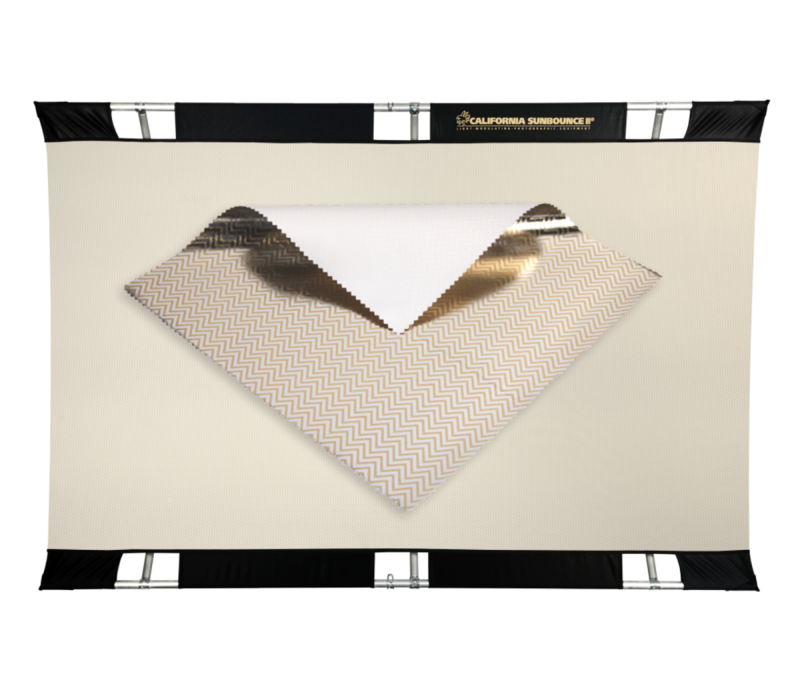 Engineered and constructed with totally quality management (TQM) in Germany. 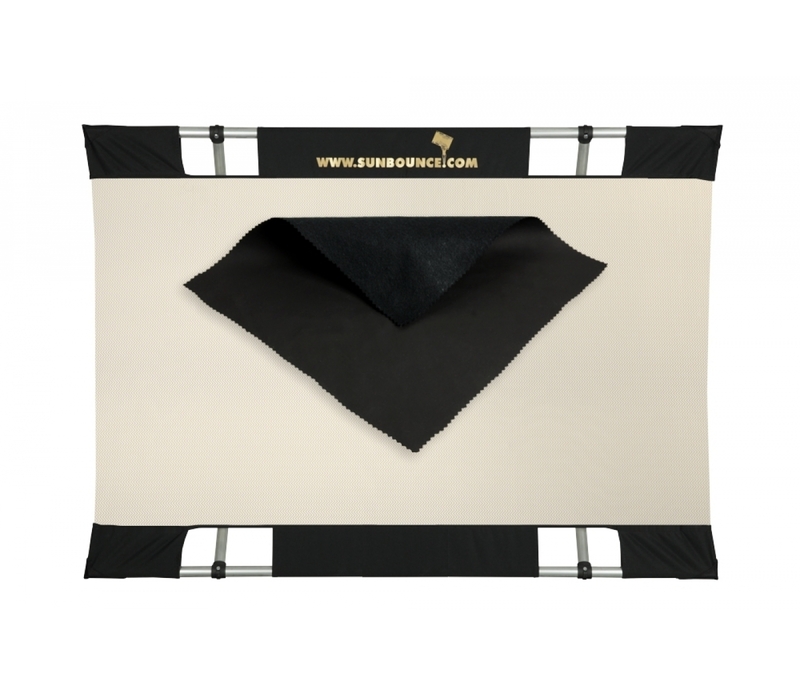 Manufactured and designed with the best products to ensure durability and ruggedness. 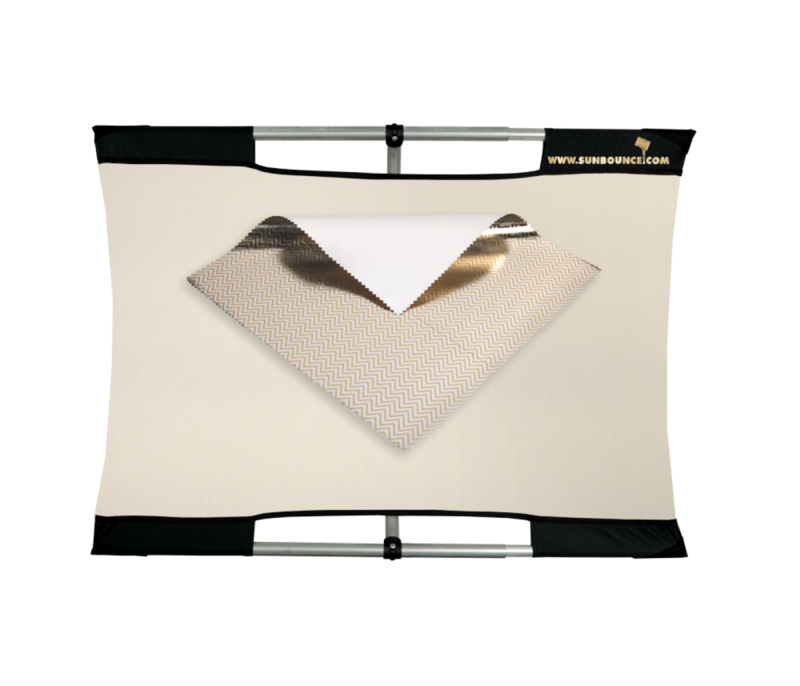 All fabric reflector screens are made in Germany and handmade to perfection.